If you are looking for a vehicle that inspires confidence, consider the Volvo XC40 Momentum. This is a popular choice for people like you who are seeking a compact luxury SUV option. 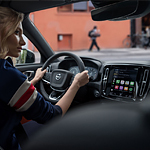 The Volvo XC40 Momentum features a driver display that helps you stay in the know as you are driving your vehicle, making it easy for you to stay at an appropriate speed and know that every part of your vehicle is working well. The seats of the Volvo XC40 Momentum can help this vehicle to stand out, as they are available in bold color choices that make them unique. The search for the perfect luxury vehicle is on now, and you may find the Volvo XC40 Momentum to be just the vehicle for you. Come to Volvo Cars Annapolis if you are interested in talking about this vehicle. Our knowledgeable staff in Annapolis will give you information and get you out for a test drive.